At least when you win. Which, despite its difficulty in accomplishing, has me repeatedly coming back for more. In Shadi Torbey’s Onirim you play the role of La Sonnambula, making your way through a labyrinth of rooms filled with beautiful dreams, disturbing nightmares, and coveted keys. 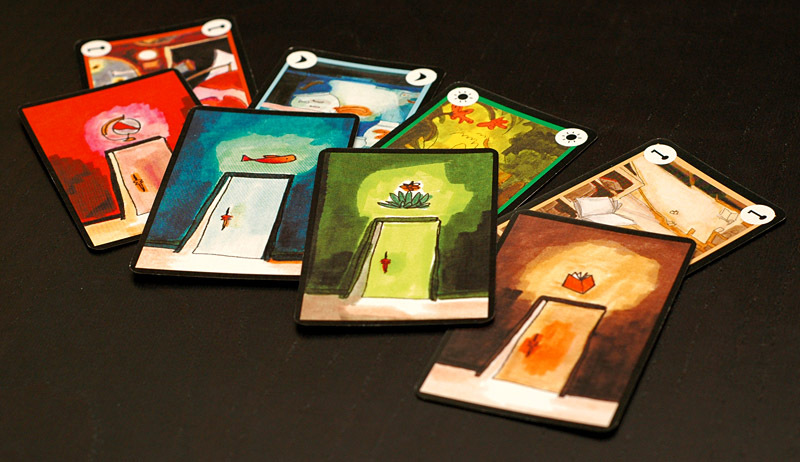 Your responsibility is to discover all eight doors by collecting sets of cards or discarding the matching keys. Now here’s Cool Thing #1 about Onirim: you can do this by yourself or in a cooperative effort with one of your best buds. I’ve personally found that playing with Chris is a lot more fun due to interactive decision-making, but if you’re looking for a game more intriguing and satisfying than the pre-loaded solitaire on your smartphone, Onirim is for you. The small game box purchased for under ten bucks (this is Cool Thing #2) is chock-full of cards; 109 of them, to be exact, separated into four types – Door, Labyrinth, Dream, and Relic – plus one Spell card. At first glance they are a bit intimidating, but upon realization that you have just received a basic game and three expansions (Cool Thing #3), all doubts are relinquished. (Speaking of variations, this would be a good time to inform you, dear readers, that I have yet to play The Towers and Dark Premonitions and Happy Dreams expansions. I can’t be having all the fun without you knowing first, right?). 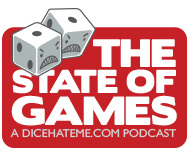 So…The basic game, a.k.a. The Doors of Dreams, and The Book of Steps Lost and Found expansion are comprised of the characteristic deck and discard piles that most card games have, but add to that a Limbo pile that temporarily contain Doors and Dreams, and you are all set to make your way through the labyrinth. Cool Thing #4 is of a visual nature. The palette of colors that bring to life the art of Élise Plessis and the attention to graphic detail are reason enough to add Onirim to your collection. Most notable are the Door cards, simple and vibrant, symbolic and inviting. Each of the colors – red, blue, green, and brown – represent entrances to the observatory, aquarium, garden, and library, respectively. The corresponding Labyrinth cards beautifully depict the still chaos of what is sheltered behind ajar doors, and port symbols of suns, moons, or keys on two of their corners. The latter of these symbols, not surprisingly, is…well, key to winning the game; they facilitate the opening of doors, and also provide a method of ridding those pesky Nightmares from entering your dreamworld. Mr. Sandman isn’t always so kind. In fact, my guess is that players more often have trouble rather than success in obtaining all the doors before time runs out, but this does nothing but make you wish the dream could last a little bit longer. With essentially eight ways to play this game (four variations playable both solo and duo) and being at the mercy of the randomness of a deck of cards, this game provides seemingly endless replay. A tactic used in one session may prove to be just an illusion in the next. Who doesn't want to feel the emotional journey of a dream? The mixed feelings of anxiety, happiness, disappointment, and satisfaction are embodied in this compact package; the linen cards gracefully and solidly host them. And they were made to withstand the repeated shuffling required. Did I say "repeated shuffling"? That's the main reason why this game can't be 6-out-of-6 fun. Cards are constantly being removed and recycled through the deck, which can break the momentum of play at times. But other than that, it's an escapade you won't want to miss out on. Overall score: 17 out of 18 - Everlasting reveries are worth the less-than-ten-dollar price tag, right? Right. 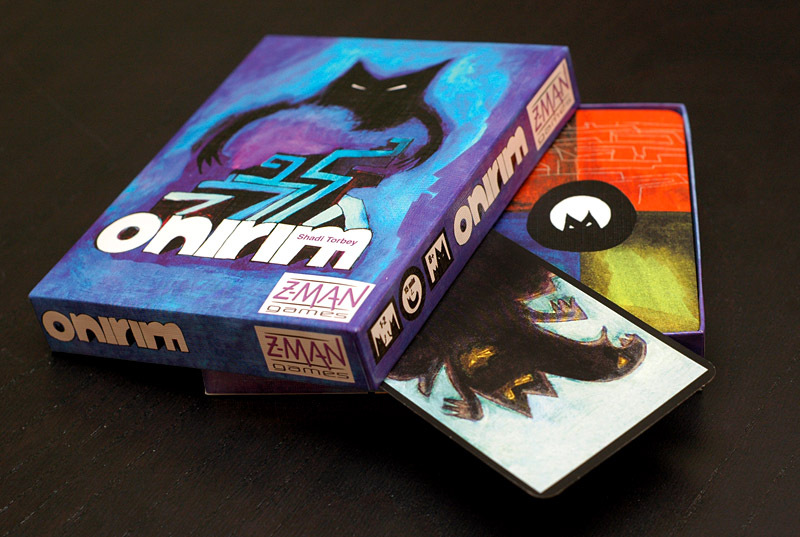 Onirim is a card game for 1-2 sleepwalkers, ages 8 and up, by Shadi Torbey from Z-Man Games. You can purchase Onirim from FunagainGames, or you can pick it up from your favorite local game store. Played through the solo game the other day, after we were chatting about it on Twitter. Forgot how much I love the artwork! Keep the reviews coming, Monkey!! Thanks so much, Alf! And a greater thanks for introducing Onirim to my life! @P. Kellach Waddle: Awesome I feel that your willingness to try play again is a good testament to my review; have fun and good luck! Great game! Can’t wait to try it as a co-op, but that might be a while! Monkey, your beautiful prose deliciously described this game Please do more written guest reviews.